While there is nothing wrong with using spreadsheets to do some quick calculations nothing beats a professional software. Would you like to control several stocks inside your portfolio. With A.I.M you can. Even more, there is a special area to indicate how much percentage you want to assign to each stock to distribute your buy or sell signals as your please. Would you like to test Split SAFE but it is too complicated in your spreadsheet? With Automatic Investment Machine this is as simple as to use different percentages for the SAFE Buy and the SAFE Sell. Would you like to try different investments scenarios but it is taking you too much time? Just change the parameters you want and click click the Recalculate button. Would you like to duplicate portfolios with all its data? Click the Portfolio Duplicate button. Would you like to have easy access to your online trading account? You can set a special button inside AIM that would let you do just that. Would you like to get quotes and copy them into your AIM system without using copy and paste AIM has a feature where you can see the last trade on any stock and you can add them or replace the existing quote with one click. Would you like to manage your portfolios even from different traders? AIM has two different areas one to manage your portfolios and another one to analyze them. Would you like to have a "private secretary" to remind you of important investment dates? AIM has an integrated, full-fledge Personal Agenda that will remind you of tasks every time. Would you like to chart you it moves your Stock, Cash and Stock + Cash at the same time? An integrated chart area will show you exactly that with just one click. Would you like to play around with Penny Stocks? 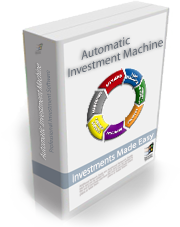 The Automatic Investment Machine is designed to handle Penny Stocks too. Would you like to explore intraday or interday trading? With AIM that is very easy thanks to its Time field and the ability to evaluate unlimited scenarios with ease. Would you like to import historical data? AIM has an integrated Import System that we allow to import from different formats. How would you like to have in one place any piece of valuable information you find on the Internet and other places? AIM has an integrated Knowledge Database that you can feed with Internet Links, texts, Word Docs, PDFs using unlimited Categories and Topics so your commulative knowledge with be handy at all times. Are you prepare to open your wallet and expend a fortune to get this wonderful software? Sorry, we will disappoint you on this one. AIM cost is a tiny, insignificant $9.97 per month. No downpayment or Setup Fee.